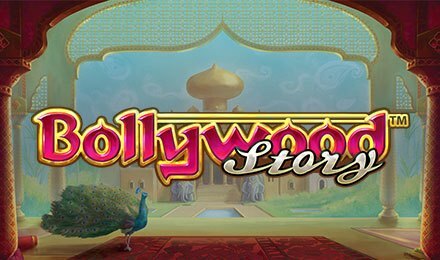 Travel to India with Bollywood Story Slot at Vegas Spins! This original game by NetEnt comes with 5 reels and 9 paylines. Discover a Bollywood style love story as you spin the reels. Meet 2 lovers who are separated due to the difference in social classes. Find out how they face hardships before they can reunite, since the girl is rich and the boy is not. This typical love story is portrayed in most Bollywood movies. On Bollywood Story Slot, the action takes place in a luxurious palace, with tall pillars and all kinds of comforts. The reels are enclosed within an ornate frame and are full of symbols like Bollywood Story Logo, Bride, Groom, Father, Mother, A, K, Q, J and 10. Launch this slot at Vegas Spins using any type of device. Enjoy Bollywood Story Slot by adjusting your stake with the + and – buttons on the Coin Value and Level fields. Next, click on the Spin tab to initiate the reels. A win is generated when combinations of 3 or more similar symbols are formed on the reels. Want to sit back and relax? Launch several rounds played without any intervention with the Auto Play feature. Bet Levels: Pick up to 10 bet levels on the Level field. Amount of Paylines Selection: All the 9 paylines are fixed and cannot be modified. Coin Values: The available coin denominators are 0.01, 0.02, 0.05, 0.10, 0.20, 0.50 and 1.00. The Floating Wild on Bollywood Story Slot substitutes for all symbols apart from Scatter. On each spin, it appears on regular symbols to convert them into Wilds. During the base game, 2 to 4 Floating Wilds are generated on each spin. The Blue Gemstone stands for Scatter and helps to trigger the Free Spins Feature. Land 3, 4 and 5 Scatters on the reels to receive 10, 20 and 30 free spins, respectively. Three to six Floating Wilds also appear on each spin. The feature can be retriggered and you can get a total of 60 free spins! When 5 Bollywood Story Logos show up, earn up to 1000x your stake! Join the cinematic experience on Bollywood Story Slot at Vegas Spins and have plenty of fun. Good luck to you!